The shrimp trawler Master D burns 40 miles off the coast of South Padre Island. 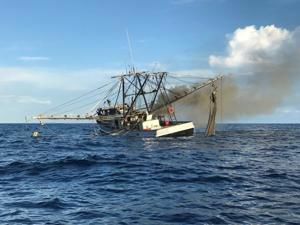 A fishing vessel sank nearly 60 miles off the coast from Port Isabel, spilling an estimated 20,000 gallons of diesel fuel and 400 gallons of lube oil into the Gulf of Mexico. The U.S. Coast Guard reports that the vessel named Master D spent two days burning before sinking to a depth of approximately 380 feet. The Coast Guard Cutter Coho rescued the three-man crew from a life raft on Friday after the fishermen activated their emergency position. The 69-foot Master D is a 122-gross ton fishing Bessel based out of the Brownsville Shrimp Basin. The incident is categorized as a major marine casualty. The Coast Guard said the Marine Safety Detachment Brownsville investigation officers and the National Transportation Safety Board are investigating the cause of the incident.